By Dr Andy Flack, University of Bristol When we think about our companion animals we tend to think of those who share our homes, who walk by our sides in our day-to-day lives. Yet, whatever your ethical position on zoos (whether you think they are little more than animal prisons or vital parts of our efforts to save species from the brink), captive creatures have historically become companion animals in their own right. They have been so much more than mere objects on display. Their keepers who, in years gone by have been allowed far greater proximity to their animals than they (usually, in good zoos, at least) are allowed today, have developed intense attachments to their animal wards. Yet, these attachments were far from one-way. Animals were active influences in the creation of relationships between species. Donna Haraway, in her excellent When Species Meet, argues that as species living together, we and our animals become entangled ‘messmates at table'. We mould our companion animals, but they influence us in equally profound ways. This process of the co-creation of relationships is clear in the context of the zoo. Elephants, for instance, are well-known for the bonds they form with humans, and zoos in the UK have ample examples of human-pachyderm bonds in captivity. At London Zoo, the famous elephant Jumbo was allegedly attached to his long-time keeper, Matthew Scott. Such was the strength of their bond that there has been some suggestion that Jumbo's departure for the US was so long-winded and problematic because Scott was deliberately sabotaging the efforts. As it turned out, Scott was allowed to travel with Jumbo to P. T. Barnum's ‘Greatest Show on Earth' in the spring of 1882. The story, however, ends in a rather darker hue; Jumbo died when he was hit by a train in 1885. It has recently been suggested that Jumbo was in the last throes of terminal illness and that, such was the strength of feeling that Scott felt for his elephant companion, he preferred for Jumbo to die instantly rather than waste away in pain. Likewise, at Bristol Zoo, a number of elephants have been involved in relationships with keepers which seem to have been reciprocal. 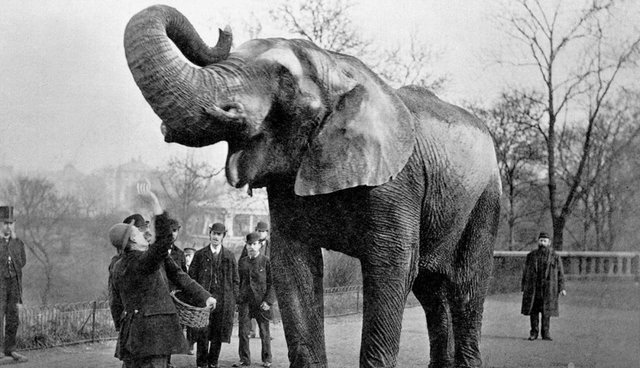 The elephant Rosie, star of stage and screen, (for she had appeared on stage in London and in a Hollywood film) arrived at Bristol Zoo in 1938 with her keeper, Tom Bartlett. Rosie and Bartlett had been together since Rosie's acquisition by a circus in 1931. So strong was the bond between the two that Bartlett set up home in a small shed directly adjoining the elephant house so that he could be by Rosie's side day and night. On the rare occasions in which he left the Zoo to go away on business or on holiday, Rosie supposedly became ‘difficult' to handle. Her relationship with Bartlett was not readily transferred to other keepers. Interestingly, too, Rosie and Bartlett were business partners; during her regular walks up and down the Main Terrace giving children rides on her back, Rosie would supposedly take money from the children and deposit it in Bartlett's pocket... The same appears to have been true of Jumbo and Scott some years earlier. Beyond elephants, great apes have also been companions for many keepers in zoos. At Bristol, one keeper developed extremely strong bonds with the apes he cared for. In many ways he came to see himself as a parental figure after having hand-reared a number of young animals abandoned by their mothers. He also made efforts to communicate with the animals, learning to ‘speak gorilla' and spending vast amounts of time inside their enclosures with them. But again, these relationships were far from one-sided. Gorillas do not allow just anybody into their living space, and this keeper recalled that the gorilla group would allow him to sit in with them and hold their new-borns. He also claimed that touch was integral to this relationship, the gorillas having been able to communicate discomfort to him through the squeeze of a hand. Captive animals were in the past, then, capable of forming strong bonds with those who cared for them. They transformed from animals crudely objectified as specimens and spectacle to creatures intimately entwined with the humans who worked alongside them.